We arrived in Gainesville, FL and the mood changed dramatically. I could feel it. We all could - even the little ones. We knew why we were there and that we had to be there...but not one of us wanted to experience any part of what was coming next. Surgery eve was awful. It was the right decision, but it was still a decision we were forced into based on a lack of other good options. Limb-salvage and a life of no sports, amputation or rotationplasty. We were tied to a railroad track and the train was coming - and we had to pick one to give our daughter the chance to escape. Bailey was actually handling things quite well. She had been working through some of the sad for weeks and she was ready to just get it over with. Patrick was at the point as well. I still wasn't ready. Sleep was elusive that night and my heart felt as though it was being smashed to pieces. I could hardly breath...the weight of this decision crushing my chest. Even with all of the assurances we had that we had made the correct choice, it was still so life-changing, there is always that doubt in the back of your mind...can we really do this? Are we strong enough? We were making the harder choice now in an effort to spare her pain later...but were we actually capable of going through with it...of partially amputating our daughter's leg and completely changing the way she looks. Agony. Morning finally came after a very dark night. With sunshine, usually comes hope. Not on this day. The light meant that it was time...and that brought no comfort at all. One foot in front of the other is the only way we made it to the hospital. Everything inside of me quaked. She was prepped for surgery and as we sat in the pre-surgery waiting area, I was drowning in fear. I didn't think I could bear it. I wanted to collapse, in fetal position...sobbing. I didn't feel that I could even live through this. But I Bailey's eyes scanning mine...trying to discern how to react. I could see her quivering...barely holding it together. If I had crumbled, she would have too and I couldn't send her back to surgery that way...hysterical. By God's grace, I managed to hold it together...but as they wheeled her off...away from us and toward the procedure that would permanently change the way the world sees her...everything in my soul wanted to run screaming, "Noooo!" I wanted to grab her off of the table and disappear out the door never to be seen again. It was too much - how could parents do this to a child? Could cancer truly be this much of a beast? She went back to surgery and I will never forget the way it made me feel...or the fear on her face. My soul was trembling. I suspect those last few minutes will haunt me, always. Surgery day was long. I would say hour for hour, the longest and most difficult day of our lives. We could have been a mess, but we held it together. So many were praying for us...I'm sure that is why. I had to consciously shove my emotions in a box because they were simply too much to deal with. Distractions, reading, friends...anything that would keep me from thinking about what was really happening to my baby back that operating room. Paralyzing heartache. She went back at about 7:45am. They called us about every two hours with updates...all of which were "good." At 3:30pm, the phone rang - she was done and in recovery. According to Dr. Scarborough, it could not have gone more smoothly. Relief. For the first time all day, I rejoiced. This was a long, challenging surgery and she had come through beautifully and we were so thankful. Even immediately after, she was already able to move her toes...which is amazing, considering what that entire leg had been through. The other news, and something we had really tried to focus on in the days leading up, was that the tumor - that hideous beast that started this mess...the tumor was out. (I would love to say she is cancer free, but I cannot. 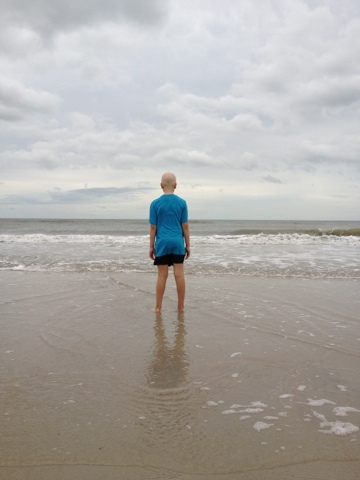 Some estimate that in 80% of osteosarcoma cases, there are undetectable mets...so we will need more chemo before she can be declared no evidence of disease). But that insidious tumor was out of our child. I braced myself as we went to see her for the first time. It was difficult. Surreal. But not as difficult as I expected. Her leg was wrapped in quite a bit of cotton and bandages, so I believe that dulls the shock to your eyes. I managed to hold it together. We will all be grieving the loss of this leg and it will take us some time to get used to her new look. Bailey was doing well after surgery. Our biggest concern, based on what others had shared with us, was pain control. But we managed to stay on top of it and she slept very peacefully that first night. Although physically she was doing well, she was struggling emotionally...shock and grief are unavoidable with a change this huge. We collapsed that evening, me in a hospital futon and Patrick in a recliner...as emotionally and physically exhausted as we could have possibly been. Thankful that this option even existed and for a successful surgery. Hurting because Bailey's life would never be the same. Surgery day was finally over. The joys and sorrows of this process seem ceaseless. "Normal" is a constantly moving target. The dry, parched land is showered with blessings, yet we are still in the dessert...and it is like nothing we have ever walked through. Oh Tiffany~my heart aches with you. . .and praying that Bailey's new normal will bring Joy you never imagined possible. HUGS!